Trek through endless meadows, alpine forests, and towering Himalayan peaks to get to Kuari Pass and Pangarchula Peak. You’ll see mighty mountains like Mana and Kamet, and will enjoy camping and trekking in some of the most spectacular terrain in Uttarakhand. 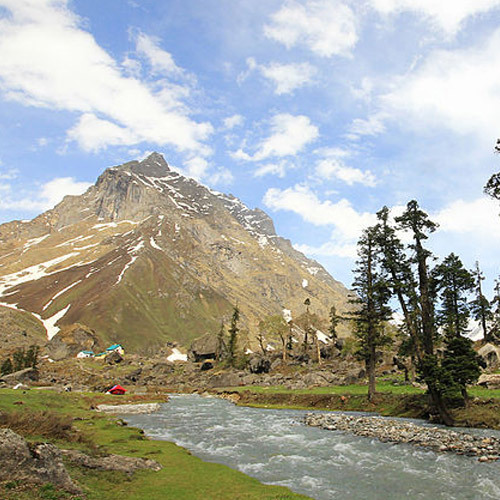 The Kuari Pass trek takes you deep into the Himalayas, where you’ll drink from sparkling streams, camp in alpine forests, and visit remote villages. At night, you and your group will stop at magnificent campsites, enjoying delicious hot meals, and sleeping like babies in tents pitched under starry skies. As you approach the scree-covered slopes near Pangarchula, you’ll receive the full mountain experience of roping up and clambering over boulders. There's no half-ways on this trek. Every sight, every peak, every meadow - the scenery is larger than life, and makes for a dramatic trek that you'll never forget. Most operators will pick you up from Haridwar and drive you to Joshimath to start the trek. If your package does not include transport, you’ll have to get to Joshimath on your own. You’ll spend a night here, in tents or in lodges, and will start the trek the next day. You’ll camp in the open at Khulara or Tapovan, and ascend to Kuari Pass the next day. If your itinerary includes Pangarchula Peak, you’ll begin the climb from Kuari Pass itself, and will return by the early evening for a night of camping. The next day, you’ll begin the descent to Joshimath. If you’re going to Uttarakhand, you might be interested in our blog on Top Things to do in Uttarakhand. The Kuari Pass trek is considered a moderately challenging trek that is suitable for fit beginners. In the winter, the low temperatures and the snow can make the trek a little more challenging. However, if your itinerary includes Pangarchula Peak, you’ll have one day of climbing that can be quite tough. You’ll be scaling 15,419 feet, and this really puts your muscles to the test. For this stretch, your guide will explain some climbing techniques, and may even rope up for tricky sections if needed. Also known as the Lord Curzon Trail, this trail remains open almost all year round, and is a popular winter trek. The pass lies at the edge of the Nanda Devi Biosphere Reserve. It is surrounded on all sides by towering mountains, which makes for some epic scenery in the winter. From Kuari Pass, you’ll get enchanting 360 degree views of the Chaukhamba Range to one side, while the summits of Mana, Kamet and Abl Gamin extend on the other side all the way to the Tibet border. In the winter, blankets of snow covers everything, transforming the green pine forests and the stark rock faces into sparkling white perfection. The trail gives you some of the finest views of Himalayan giants like Nanda Devi, Dronagiri, and Trishul. It is said that the views on the Kuari Pass winter trek are the best in the Indian Himalayas. If you’re a first-timer or are looking for an easier trek, check out our blog post on Easy Snow Treks in India. During the summer, the Kuari Pass trek is gorgeous, and will give you unlimited views of greenery and mountain peaks in the distance. The camping experience is wonderful, and you’ll have cool nights and pleasant days. However, if you’re looking for a fun challenge, try the Kuari Pass winter trek. The trails are covered in snow, and you’ll have stunning views of the landscape blanketed in white. 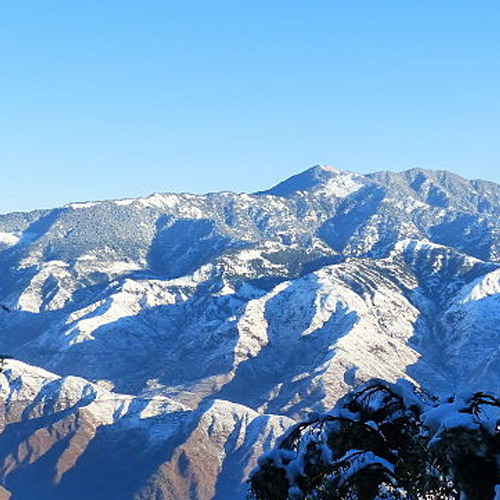 Apart from the Kuari Pass trek, there are many winter treks in Uttarakhand that you might want to check out during this season. The trek to Kuari Pass gives you some of the best views amongst the Himalayan treks in this region. You'll be breathing in the crisp mountain air, walking through lush forests, fields, and narrow village paths. For the Kuari Pass trek, You'll walk along routes that are flanked with snow-capped peaks in the distance. From the trail, you'll get close views of legendary Himalayan peaks like Mana, Kamet, Dronagiri, and the ridges of the Nanda Devi sanctuary. While the Kuari Pass trek itself is an unforgettable experience, the highlight is clearly the Pass itself. Here, you feel the rush of victory and adrenaline because you've reached your destination. The winds rush through the Kuari Pass, buffeting your body, and making you feel like throwing your arms up and screaming for joy! The Kuari Pass trek is a whole different feeling. Personal expenses including telephone calls, laundry, tips, personal porter charges, etc. The Kuari Pass trek is one of the most scenic treks in the Himalayas, but with the addition of the Pangarchula Peak, it becomes a memorable adventure as well. Also known as the Lord Curzon Trail, this trek is a moderately challenging one, except for one day when you’ll put your climbing muscles to the test as you climb to Pangarchula Peak, which stands tall at 15,419 feet. Your guides will take you through a brief course on climbing techniques, and may even rope up certain sections if needed. This trek to Kuari Pass will be a thrill for fit trekkers who enjoy a challenge. 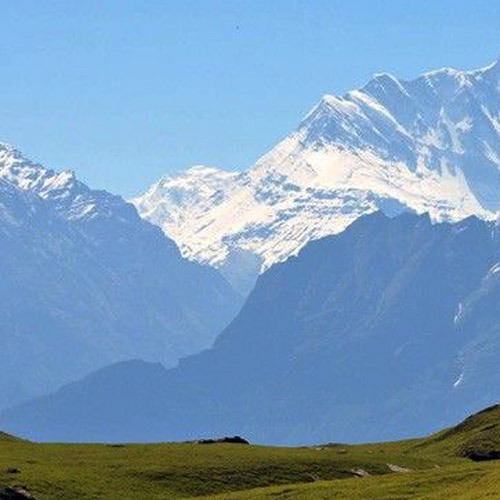 The Kuari Pass trek is perfect for those who want to experience the grandeur and majesty of the Himalayas. There's no half-ways on this trek. Every sight, every peak, every meadow - the scenery is larger than life, and makes for a dramatic trek that you'll never forget. While this 5-day trek is not a difficult one, it takes you up to a pretty high altitude in a short time. This means you'll have some steep inclines to scale at your own pace. You'll be camping on snow, walking through snow, and playing in snow. 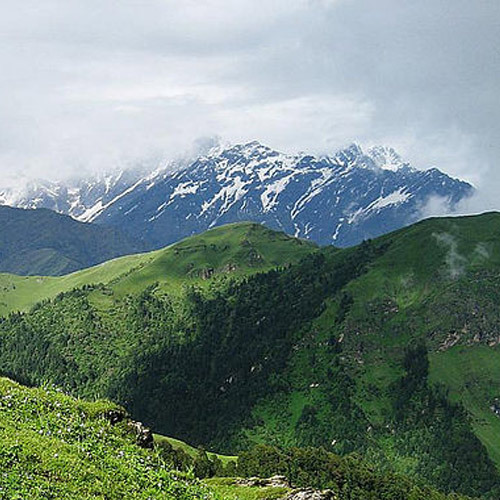 The Kuari Pass trek, also referred to as the Lord Curzon trail trek, is surely one of the finest and most popular treks in the Indian Himalayas. The trail gives you some of the finest views of Himalayan giants like Nanda Devi, Dronagiri, and Trishul. In the winter, the Kuari Pass trek is even more magnificent, thanks to a blanket of snow covering everything. On this 5-day trek of moderate intensity, you will climb through beautiful mountain villages and see their culture and hospitality. You will walk through flawless meadows, and stay at gorgeous campsites, but most of all, you'll get the full winter mountain experience. Camping gear: sleeping bags, mattresses, stools and tables, mess tent, toilet tents with portable toilet seats. Fresh mountain air. Snowy trails. Wide open spaces. 360 degree views extending from the Tibet border, encompassing the entire Garhwali Himalayan range. Sounds like heaven right? Go on the Kuari Pass Trek in winter, and that’s exactly where you feel like you’re going! Being one of the few trekking destinations that are open in the winter, this is a popular end-of-the-year trek. But it’s also the spectacular views that make this so famous. 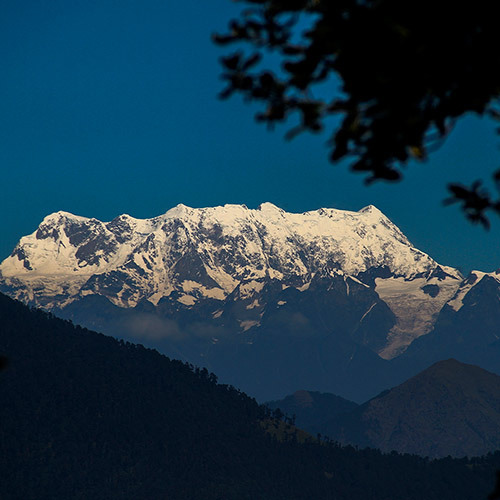 As trekkers walk through lush fields, forests and remote villages, they are rewarded with enchanting views all around of the Chaukhamba Range to one side while the summits of Mana, Kamet and Abl Gamin extend on the other side all the way to the Tibet border. Transport from Haridwar-Joshimath-Haridwar (Can be arranged at an additional cost - The total cost of transportation one way is Rs. 6000 (to be shared among 5-6 people, i.e Rs. approx Rs.1000 per person one way) – to be paid directly to the driver. The Kuari Pass trek is one of the best treks in India, not just because of the route and views, but because of the experience of trekking. 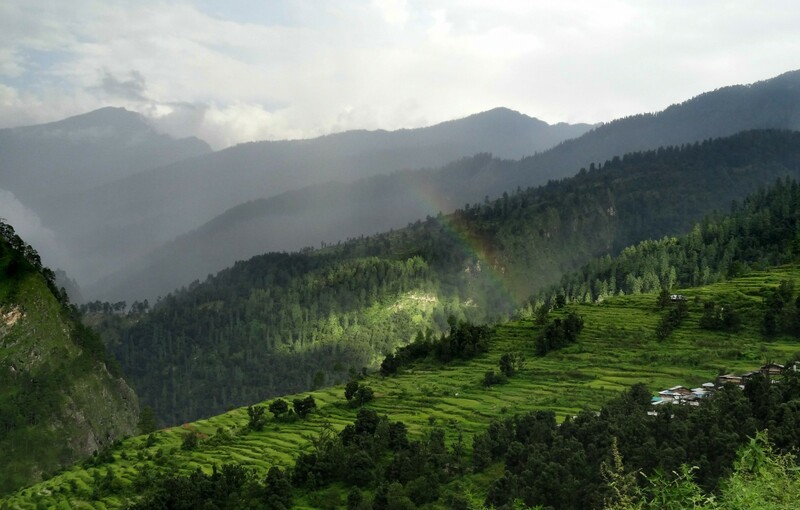 You'll trek through vast rolling meadows, through pine and deodar forests, and up beyond the tree line, where the views of snowy mountains surrounds you. From this trek, you'll get to see views of Himalayan legends like Nanda Devi, Dronagiri, Kamet, Kedarnath and Neelkanth up close. This trek combines the gorgeous route to Kuari Pass with a climb to Pangarchulla Peak at 14,700 feet, which can be quite tricky, with a steep trail and unpredictable weather. But you'll end with a dip in the hot springs at Tapovan, which is perfect to soothe those aching muscles. The Kuari Pass trek, also referred to as the Lord Curzon trail trek, is surely one of the most popular and finest treks in the Indian Himalayas. 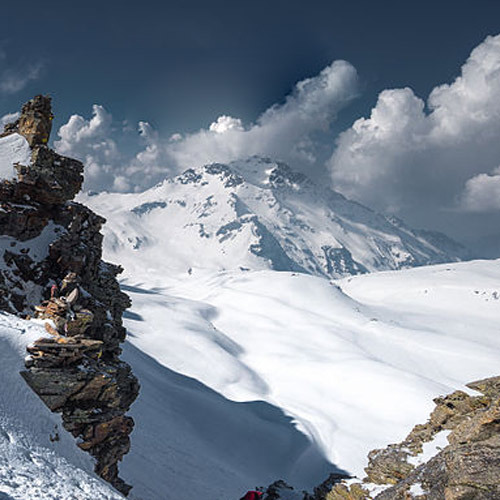 We added an adventure element to this trek by introducing trekking in snow, and skiing on snow-filled slopes. On this 6-day trek of moderate intensity, you will climb through beautiful mountain villages, and experience their culture and hospitality. You will walk through flawless meadows, and stay at gorgeous campsites that offer panoramic views of some magnificent Himalayan peaks. 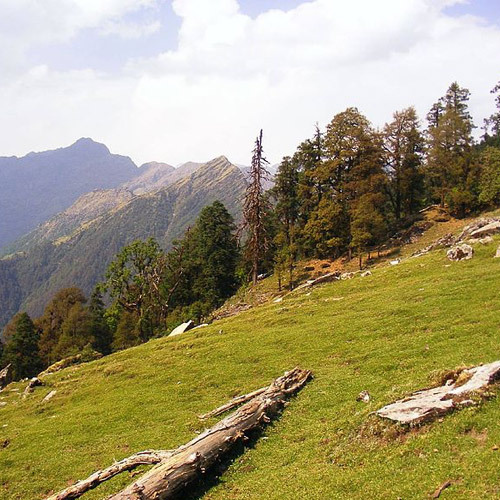 This is an exciting 6-day trek to Kuari pass in the Garhwal region of the northern state of Uttarakhand. 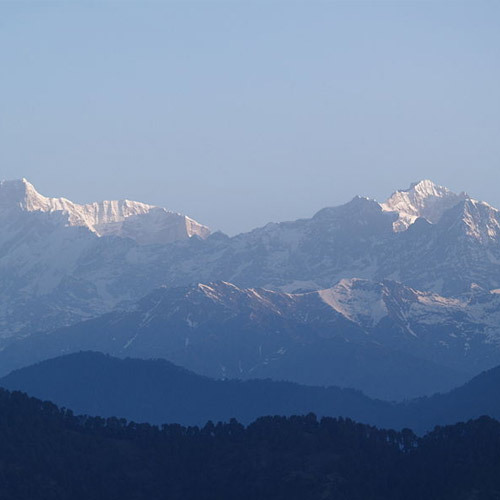 The trek takes you to scenic locations which offer magnificent views of the mighty Himalayas. Participants get an opportunity to camp in the wilderness of the Himalayas. This is an easy trek, that is perfect for newbies trekkers looking for their first taste of adventure in the Himalayas. IMPORTANT: This is not a fixed departure trip, so a minimum group size of 6 pax is required to make a booking. This will be a private trip, just for your group. One of the best ways to get a splendid view of the Himalayas, the Kuari Pass trek is a must for both, beginners and experienced adventure travellers. This is a moderate trek that passes through dense forests of oak, pine, rhododendron, fir and deodar. It takes you through vast bugyals (meadows) and numerous streams. Third AC travel from Mumbai to Haridwar and Haridwar to Mumbai. Transport by non A/C vehicle from Haridwar to Ghat and Joshimath to Haridwar. Personal expenses like cold drinks, mineral water, etc. Can beginners do the Kuari Pass trek? The Kuari Pass trek is graded as moderately challenging. This means that prior trekking experience helps, but fit beginners can attempt it too. In the winter, the climb will be more difficult, thanks to the low temperatures and the thick snow that covers the trail. How difficult is the Pangarchula Peak climb? Climbing to Pangarchula Peak is tough, and may require you to rope up for the more difficult patches. In the winter, the weather at the peak can be stormy and unpredictable. At the base, the trek leader will decide if trekkers can attempt the climb, based on the weather conditions. What is the best season for the Kuari Pass trek? 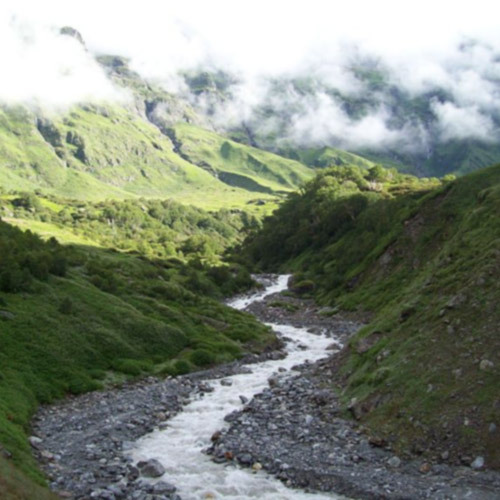 The Kuari Pass trek is very scenic in summer, when the days are pleasant and nights are chilly. The forests and meadows are lush green, and the skies are clear and blue. You’ll get beautiful views of the mountains all around, so this is a popular time for photographers. However, in the winter, the all-white landscape is absolutely stunning, with snow-blanketed meadows and white-capped mountains all around.